This article will be bilingual. The written part is going to be in English, but, since there are no Kawaii Box unboxing reviews in Spanish on YouTube, I decided to do it on my mothertongue. So the video is in Spanish. First things first: What is Kawaii Box? There are several subscription box services going around for the last couple of years. And in the case of Kawaii Box, it is kind of self explanatory: Kawaii products, or to be more clear, cute Korean and Japanese products and goodies. The biggest thing about Subscription Boxes, and what makes them great, is the whole process of finding out what my box brings (as not all boxes are the same, which is why this is part of the Surprise ). This process is part of the experience, as it makes you feel like it´s Christmas Day and you´re a kid all over again. The pricing for Kawaii Box is very reasonable, and yu can get yourself (or for others) a monthly “birthday present” for a few bucks. What came inside my Kawaii Box? Every box brings somewhere between 10 to 12 products each month, and the products usually include stickers, mobile phone accesories, candies or coookies, and other little things. Since it is Kawaii themed, it is guaranteed to be cute. Kawaii Box Unboxing Video: In Spanish! Starting with four Cute Bunny Paperclips. A Moomin plushie, which is some kind of a gerbil. A Taiyaki Crepe Charm, which is a fish-shaped cake, so you can put some styling to your mobile phone. My personal favorite (to add to my massive styled pen collection), a Lucky Baby Sheep Pen. A DIY Bead Bracelet Set with tons of cute figures and shapes to create your own jewelery. A Korean DIY Magic Ballon Set, to do ballon tricks and funny shapes. It comes with some stickers to personalize the ballons, and a few tutorials to create flowers and animals. A Korean DIY Stiching Keychain, so you can personalize it for yourself to up the cutiness ante. A Funny Forest Greeting Card, with a cutout of a cat saying hi! Some Bourbon Petit Green Tea Flavored Cookies. )I had never tasted green tea cookies before, they are very crunchy and not overpowering. 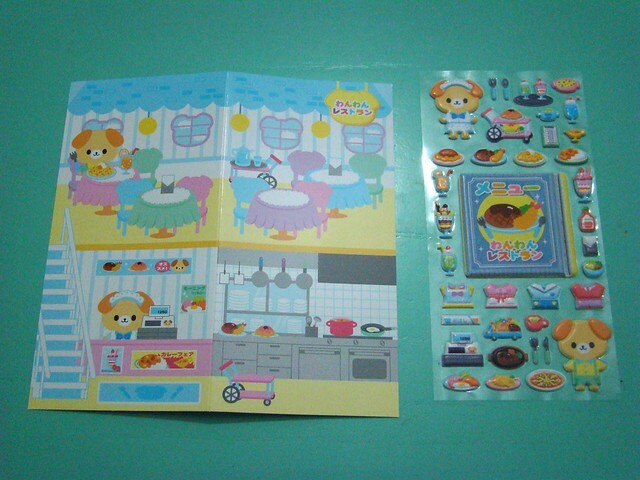 A Neko Sticker Sheet, with a dining and a kitchen scene. The Pricing of the Kawaii Box is final, as the delivery is free. There are three prices: If you subscribe for 1 to 3 months, you will pay 19,80 dollars per month; for 6 months subscription, the box goes for 18,80 bucks each; and for the annual box, subscription goes for 17,90 dollars. The delivery comes from very far, as these are Kawaii products. To get to me, it took a long long time, mostly spent on customs to be cleared (my country is strange in that sense). Probably for US it will take 2-4 weeks. Even though you may find something kinda like these products in your local Daiso, this is very very different. Last time we went to Daiso we didn´t get anything we liked; in this box alone, I found several keepers (mostly for my niece, except for the pen, which goes to my collection). At this point, I am going to invite you all to a Contest and Giveaway for one lucky winner to get a box delivered t you, anywhere in the world! You will need to enter the contest below, and you can be the lucky winner of one Kawaii Box!